Third-year pro Brian Gibbons had two points, including a shorthanded goal in the second period, to lead the Wilkes-Barre/Scranton Penguins to a 3-1 victory over the Hershey Bears in their home opener. 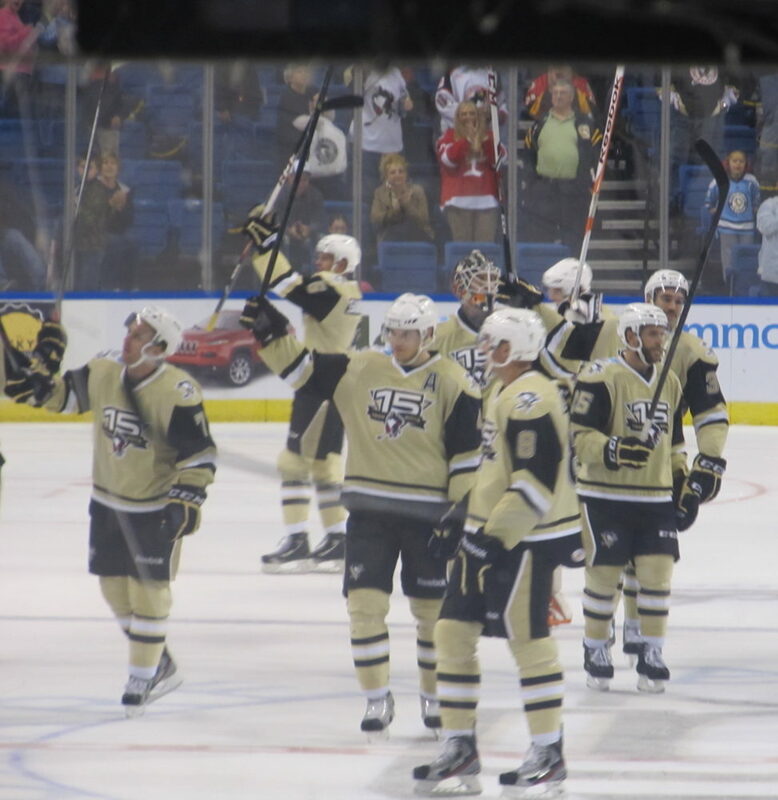 Prior to the game, fan favorite Tom Kostopoulos said it’s always good to see the team fired up for a fresh season. A scoreless first period saw the two teams exchange penalties, with Penguins players going to the box three times and the Bears serving two penalties. WBS goaltender Jeff Deslauriers made two key saves, including a glove save at 5:34 while Harry Zolnierczyk and Derek Whitmore sat for matching roughing calls. Deslauriers then made a sprawling stop at 12:48 while Dominik Uher was sitting for elbowing. The period ended with the Bears and Pens each notching five shots on goal. In the second period, Tomas Kundratek put the Bears on the board first at the 4:05 mark. It was his first goal of the season, and he was unassisted. The Penguins had a scoring chance about 30 seconds later, but Zolnierczyk was taken down behind the Pens goal on the play. Gibbons broke through Bears defenders while Tom Kostopoulos was in the box for interference and scored shorthanded at 7:31. Jayson Megna picked up the assist. Gibbons had two shorthanded goals for the Pens in the 2012-13 season, and his goal on Saturday was his first of the new campaign. Although the teams were tied 1-1 after two, Hershey held the advantage in shots, 14-6 in the second and 19-11 overall. The third period got physical, and Jamie Johnson and Philip Samuelsson received roughing minors at 6:23. During 4-on-4 play, Chris Conner had a breakaway, but was denied by Bears goaltender David Leggio. Leggio came up big again on a Zach Sill slapshot at 12:25, grabbing the puck out of the air. The Bears then received a power play on a delayed call at 13:50, as Sill went off for elbowing. Their best scoring chance came as the penalty was expiring, but Deslauriers came up with the save. 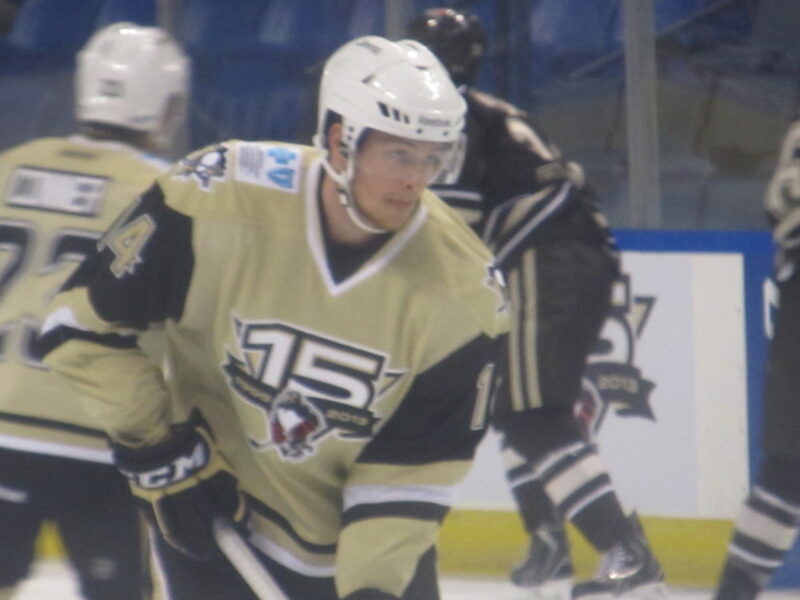 Wilkes-Barre/Scranton broke the tie at 17:22 with Conner’s third goal of the season, and Gibbons picked up his second point of the night on the assist. This turned out to be the game-winning goal, but Sill buried Hershey for good at 18:47 with his first of the 2013-14 season. Dominik Uher and Kostopoulos assisted. The Penguins improve to 2-0 on the season, while the Bears drop to 0-1-1. It may be early in the year, but as Hynes said on WNEP-TV, the Pens shouldn’t discount the importance of these first few games. Saturday’s home opener gave the Penguins a chance to kick off their 15th season in front of their fans. The team donned Vegas gold jerseys with the official 15th anniversary logo on the front. This year’s team captain is Tom Kostopoulos, with Zach Sill and new arrival Brendan Mikkelson serving as alternate captains. Former Penguin Greg Crozier participated in the ceremonial first puck drop prior to the game. In the pregame ceremony, it was announced that the team would be honoring past Penguins all season. Crozier scored the first home goal in team history back on November 13, 1999 against the now-defunct Kentucky Thoroughblades. The Baby Pens will travel to Syracuse to take on the Crunch on Sunday at 5:00 p.m. The Bears are idle until Friday, October 18 when they will be in Canada to take on the St. John’s IceCaps.